In the grand facial scheme, losing eyelashes admittedly isn't as big a deal as losing eyebrows in terms of the difference it makes to a bare face. However, on closer inspection it does subtly change the appearance of your eyes, as even the most fair-haired eyelashes lend a certain framing to the eyes, and seeing them without that framing is a real surprise. You can feel your eyes look smaller - on down days, even a bit 'beady'. So: what you need to is to paint that framing back on. This first guide is a how-to that recreates the look of eyelashes without false eyelashes. I'll cover falsies in a later post, but for ladies who are experiencing temporary eyelash loss (for example, women undergoing chemo), the make-up-only route is best. False lashes are a fiddly pain to apply, and by the time you've got the hang of it, your real lashes will have grown back, so they're really a more long-term solution. Make sure you start with a clean, dry skin surface, as this ensures the make-up you then apply stays put all day. Your best bet: gently patting a little translucent powder over your eyelid. A nice 1950s-style sweep of eyeliner along the lashline of your upper eyelid will frame your eye and give the illusion of lashes being there. Unless they’re incredibly close to your face, no-one will be able to tell there aren’t actually any lashes there. Liquid eyeliner has an unfair reputation as being nigh-on impossible to apply, but it's really not. You just need to use a product with the right-sized nib: not too hard, not too soft and the right thickness. (Avoid the ones with the really thin, one-hair-thick brush, as they're too tricky to control.) Hands-down, the best one I've ever found is the Rimmel London Exaggerate liner pictured: it stays on all day, doesn't crumble, and has the perfect nib! To apply, gently pull the skin of your eyelid taut with one hand, and starting from the inner corner of the eye, slowly paint along the lashline with the other. Rather than trying to do it in one neat sweep, just do the line in stages. To really open your eyes up, go a little beyond the edge of your eye, and add a little flick at the corner. (Cautionary visual note: resist the temptation to go overboard with this one...). If your line goes a little wobby, it can be easily rectified with a wet cotton bud. For extra naturalness, you want to keep your line soft. Using a small brush or cotton bud, smudge a little black eyeshadow along the top edge of the liquid liner to soften the line. Now, the finishing touch: smudging in 'bottom lashes'. 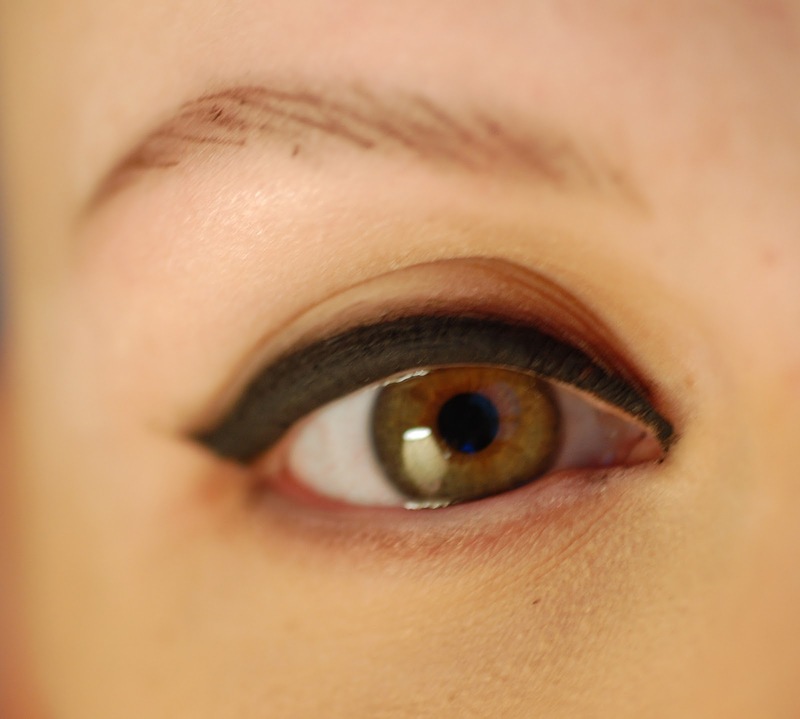 To do this, I like to first run a white or pearly eyeliner along the inside of my bottom eyelid - this widens the eye. Then, I dab a little black eyeshadow under that, to replicate the look of lashes. And there you go! Unless anyone gets truly up-close, or looks at your eyes from the side, nobody will be able to tell that you're lash-free. Dear Carly, I live in Greece so we don't have all the products you have, so I was wondering if you could suggest to me some more common brand names for liner pens. I don't need waterproof pens, but a good liner pen for recreating eyebrows and eyelashes, the way you teach (I love your videos - just discovered them and they are very helpful). If you are not allowed to post any brand names here, you can go through my blogger profile and find my email to reply to me there. I would really appreciate it, because I don't know much about make-up. Thank you so much! Thank you Carly! I'll have a look! Carly, I've just discovered you and I am in awe. I've had alopecia since I was born practically. I was 7 months old when I was first diagnosed. You can say I grew up with this, but I really only lost all my hair around 9 years ago. I wear wigs but more and more I've been considering not wearing them anymore. We'll see, haha. Anyway, lost my hair 9 years ago, my eyebrows around 3-5 years ago and have begun to lose my left eyelashes about 3 months ago. I just watched your tutorials on these and I'm sure it'll work miracles. I do have a question about your brows. Your tutorials seem like your technique is so much nicer and natural than mine, however I see that in your videos before you start your routine there's some sort of shadow on your eyebrows, that sort of holds the shape. Did you lightly tattoo them or do you still have some? I have nothing so shaping is always so so hard and I've considered tattooing but I'm scared they mess it up. Did you tattoo if so do you recommend? Or is it that you still have some? Again, I am in awe and I think I am your newest biggest fan! Thank you for sharing the tutorial and the tips!